Offering you a complete choice of products which include Hair Loss Medicines such as Hair Care Oil, Hair Care Products, Herbal Hair Treatments for Women & Men, Hair Care Capsules, Ayurvedic Hair Oil and Herbal Hair Oil. The remedy contains 6 exclusive herbs to Herbal Hair Treatments for Women & Men add volume to the hair. It stops the greying and also hair loss. Brungraj (Eclipta Alba) 220 mg, Bhumi Amla (Phylanthus Niruri) 220 mg, Amlaki Rasayan (Emblica Officinalis) 53.35 mg, Trikatu (Ginger, Marich, Pepper) 3.35 mg, Praval Pishti (Red Coral) 3.5 mg. 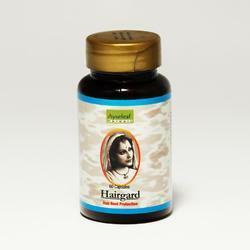 The remedy contains 6 exclusive Hair Care Capsules herbs to add volume to the hair. It stops the greying and also hair loss. Brungraj (Eclipta Alba) 220 mg, Bhumi Amla (Phylanthus Niruri) 220 mg, Amlaki Rasayan (Emblica Officinalis) 53.35 mg, Trikatu (Ginger, Marich, Pepper) 3.35 mg, Praval Pishti (Red Coral) 3.5 mg. It makes the hair soft, rich and long. 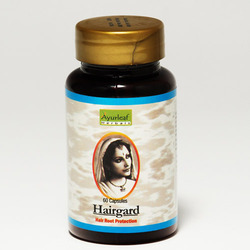 The remedy contains 6 exclusive herbs to add Hair Loss Medicines volume to the hair. It stops the greying and also hair loss. Brungraj (Eclipta Alba) 220 mg, Bhumi Amla (Phylanthus Niruri) 220 mg, Amlaki Rasayan (Emblica Officinalis) 53.35 mg, Trikatu (Ginger, Marich, Pepper) 3.35 mg, Praval Pishti (Red Coral) 3.5 mg. The remedy contains 6 exclusive herbs to add volume to Hair Care Products. 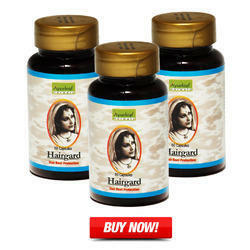 Hair Guard Hair Treatment stops the greying and also hair loss. 1 or 2 capsules per day. India has of the oldest, richest and most diverse cultural traditions associated with the use of medicinal plants. Shree Phalgunam Pharmaceuticals, known for its enduring commitment to making you feel and look gorgeous with attractive shiny black hair which brings the beauty with traditional richness. Thampurattys's Thankam - made with dedicated care to glorify the princess in every women. Formulated without Electronic Vibration, Chemical, Colour, Perfume and Preservatives. Complete manual process for protect the natural goodness of Green Medicinal Plants, Herbs and Oil which our Scalp and hair truly deserves. Scalp provides vital nutrients to hair, which keeps our hair healthy and preventing hair from falling. Complete manual process for protect the natural goodness of Green Medicinal Plants, Herbs and oil. Formulation practiced by family who transmit the techniques from parents to children. India has one the oldest, richest and most diverse cultural traditions associated with the use of Medicinal Plants. We would welcome the opportunity to earn your trust and deliver the best services in Ayurveda. Directions to use:- Use everyday night over cleansed wet scalp for optimal results. Apply 2-5ml oil directly on the scalp and gently massage for 2 minutes. Leave overnight and wash in the morning. Formulated without Electronic Vibration, Chemical, Colour, Perfume and Preservatives. Complete manual process for protect the natural goodness of Green Medicinal Plants, Herbs and Oil which our Scalp and hair truly deserves. Scalp provides vital nutrients to hair, which keeps our hair healthy and preventing hair from falling.Complete manual process for protect the natural goodness of Green Medicinal Plants, Herbs and oil. Formulation practiced by family who transmit the techniques from parents to children. India has one the oldest, richest and most diverse cultural traditions associated with the use of Medicinal Plants. We would welcome the opportunity to earn your trust and deliver the best services in Ayurveda. Formulated without Electronic Vibration, Chemical, Colour, Perfume and Preservatives. Complete manual process for protect the natural goodness of Green Medicinal Plants, Herbs and Oil which our Scalp and hair truly deserves. Scalp provides vital nutrients to hair, which keeps our hair healthy and preventing hair from falling.Complete manual process for protect the natural goodness of Green Medicinal Plants, Herbs and oil. Formulation practiced by family who transmit the techniques from parents to children. The remedy contains 6 exclusive herbs to add volume to the hair. It stops the greying and also hair loss. Bringraj (Eclipta Alba) 220 mg, Bhumi Amla (Phylanthus Niruri) 220 mg, Amlaki Rasayan (Emblica Officinalis) 53.35 mg, Trikatu (Ginger, Marich, Pepper) 3.35 mg, Praval Pishti (Red Coral) 3.5 mg.